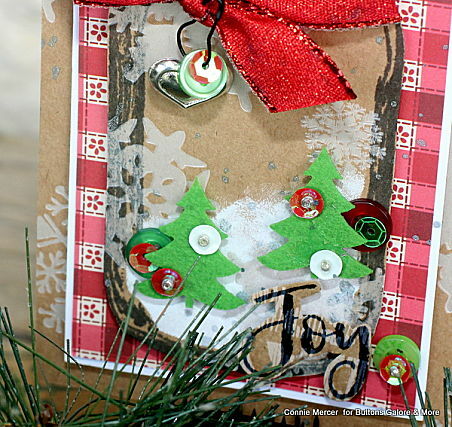 Hi, Connie here with Buttons Galore & More design team sharing a Christmas card using the Holly Jolly embellishment kit by 28 Lilac Lane. It is never early enough to start thinking of creating special, one of a kind, Christmas cards for those special people you love. 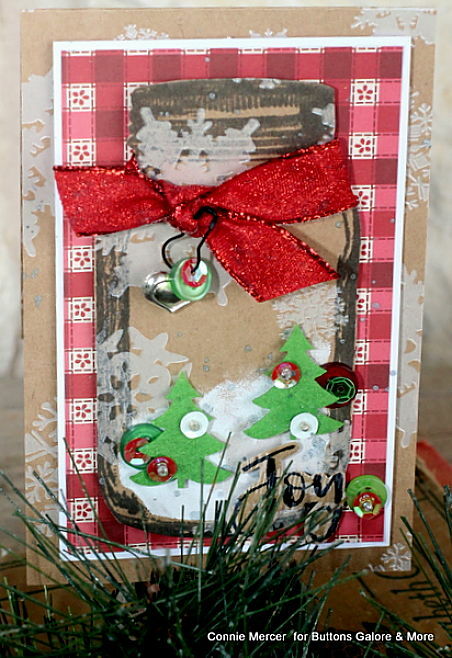 28 Lilac Lane has put together embellishments kits that take the guess work out of creating special cards. 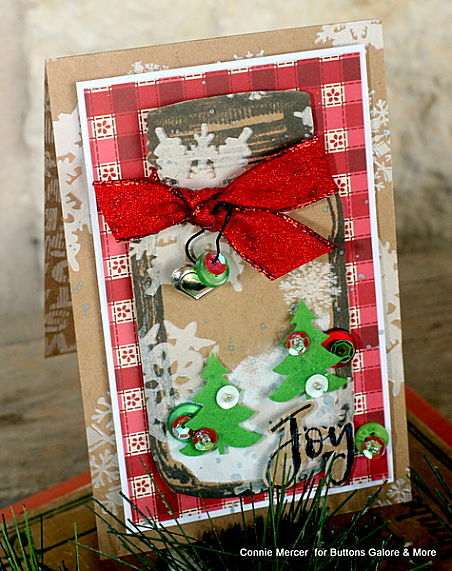 Holly Jolly is the Christmas embellishment kit that is full of festive embellishments that will make beautiful cards. The cards people will want to keep and display! Using a rubber stamp, the mason jar was stamped on pattern paper and cut out. A Christmas/Winter scene was created inside the jar using the embellishments from the Holly Jolly embellishment kit. The snow is white acrylic paint and the small felt trees are in the Holly Jolly embellishment kit. The kit is full of sequins, beads, pearls, charms, ribbon and buttons. Green, red, large and small buttons!! You will want to add them everywhere. The small seed beads make beautiful centers for the sequins. Easy to place with a drop of glue and tweezers. A sentiment, for the Christmas card, was stamped using a rubber stamp and then cut out. Gloss was added to the sentiment for extra shine. The card was speckled with silver paint for more shine, after all, it is a special Christmas card. Thanks for stopping by and I encourage you to check out the 28 Lilac Lane embellishment kits. They are full of pretties! Ohhhhhhhhhhhh this is FABULOUS! LOVING the winter scene you created!!!!!!!!!!!!!!!!!! That is soooo adorable. Love the winter wonderland in a jar. Soooo cool. Found your blog from my memory box email. Just learning about blogs and blog hopes. I so enjoyed seeing your creations, love the one of the top as I have boston terriers myself.